This is a lovely shrub rose, sometimes considered a floribunda. 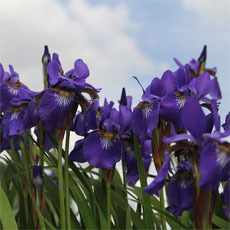 Flowers are small, to 1.5", with up to 40 petals. 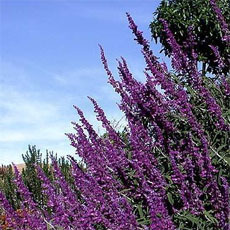 Prolific bloom throughout the season. Before the introduction of the Knockouts, this was arguably the world's most widely planted rose. Known for its vigor and disease resistance. The Montreal Botanic Garden in 1998 released a survey of black spot resistance in their roses and found this among the most outstanding. I've seen a little black spot on those I maintain, but they're not favorably situated. Like most roses, this one isn't fussy about soil pH. Optimal pH for roses is 6.0-6.5, but more or less acid is fine. 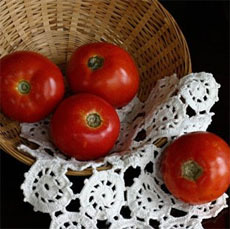 The cultivar name is 'MEIdomonac.' "Bonica" is a trade name. I have two Bonicas growing happily in my zone 3 garden in Calgary, Alberta. 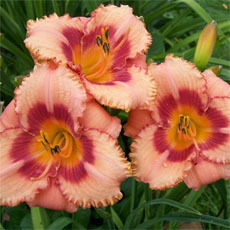 They are prolific bloomers throughout all of our short season. They do not need any winter protection. This is a lovely rose!! This rose is more hardy than many but not as hardy as advertised, in my experience. I needed to box it up and bury it in ground to get it through a Wisconsin (zone 5) winter. The growth habit was more like a shrub rose than a standard floribunda. You are not going to get cut flowers from this one; the stems are too short. This rose was the very best in refusing to accept the end of summer. I once picked one on November 11, which is extraordinary in NE Wisconsin. Where I live, Nov. 11 is often within a week or 10 days of the first lasting snow. Anything that fights to hold on to summer that long deserves a positive rating! I have had eight Bonica roses growing in front of my house for the last twenty years. They are extravagant bloomers in June and then repeat bloom, though nowhere near as heavily the rest of the season, all the way to November. My problem with them is that they start to defoliate every summer around August. It is now the beginning of September and at least a third to a half of all leaves are off the plants. They yellow, develop black spot and then drop. I water them well all through the growing season. I fertilize them three time int the spring and early summer. I cultivate the weeds that grow around them and make sure they have plenty of air circulation on all sides. I water every other day when there are drought conditions. They come back strong every spring and I keep them pruned ... read moreto about four feet high and try to dead head as much as possible through the summer. Have others had this leaf drop problem? Strangely enough, they still keep blooming and their stems remain green. I've had the Bonica for several years, each year I prune it lightly. This year, I guess I didn't prune it enough: it is so loaded with blooms that it's collapsed onto the rest of the garden. When it rains the branches nearly touch the ground. I've tried tying it up, but it just keeps growing and budding, so I can't cut off all the buds. Would it take a hard pruning this fall and still live? Has anyone else had this problem? Otherwise, the most indestructible (and always-blooming rose) in my garden. Just wish it had a stronger scent. A tough, vigorous rose. Relatively pest-free and flowers with abundance from late spring until frost. Hips are attractive in winter. Should be cut back and shaped in early spring to maintain good form. I love this rose. I wanted a rose that would make a shrub border in front of the house. This has been a problem area, since it only gets about 3 hrs of sun in the late afternoon. I had tried ballerina which is suppose to be very shade tolerant. It did okay, but the color of the rose turned out to be almost white when it is usually a nice medium pink. I then tried Bonica and it has done very well, blooming consistently beautiful pink flowers. It may get a few less flowers in this area but not enough to make a difference in the beauty of the bush. My rose bush has been blooming all spring! It's July and I still see buds forming. Love watching the rose open and the bloom is beautiful. A terrific shrub rose. Very good disease resistance, cold hardiness and vigor. 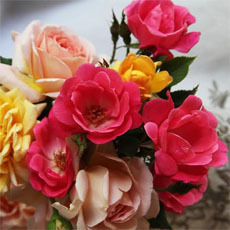 An attractive plant with pleasing small pink roses. Nearest thing to a plant it and forget it rose. 'Bonica': A sweetheart of a rose, 'Bonica' combines both virtue and popularity. It was the first cultivar in the shrub group to win AARS honors (in 1987), and its success helped create a market for the many easy-care shrubs now available. 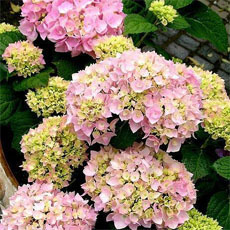 The green-apple-scented blooms are small, cupped, double rosettes with medium-pink centers and lighter edges, borne in graceful clusters. If not deadheaded, 'Bonica' sets hips in fall. 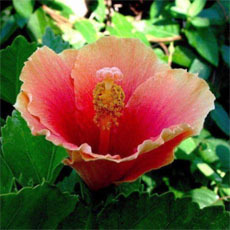 She's constantly in bloom, with small, dark, semiglossy, disease-resistant foliage. 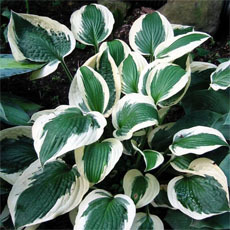 Give her some afternoon shade in warm climates: blooms fade to white in hotter regions. Hardy to Zone 4 or 5. 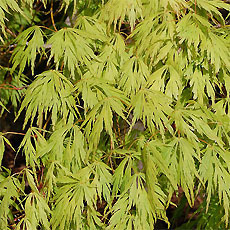 Vigorous, upright, somewhat spreading shrub, reaching 3 to 5 feet in height. Introduced by Meilland 1982. I ordered this rose in a group of 'Meidiland' roses in 1994. There were five altogether, and this is my first choice. Of the others 'Scarlet Meidiland' is my second favorite. This is my 12th year of growing this rose, and all I can say is "Very Nice"! This is a gorgeous rose bush that performs all summer long with multiple blooms. My rose bush has had so many blooms at once that you can't see the foliage.